Sweeten up your day with a treat from FiveStar. Whether you’re craving cookies like your grandma used to make or a melt-in-your mouth Krispy Kreme doughnut, we’ve got you covered. We also have fruit cups for the days where your sweet tooth is trying to keep it extra healthy. Cookies and Sweets There’s just something about old-fashioned treats like No Bake Chocolate Oatmeal cookies and Homemade Banana Bread. 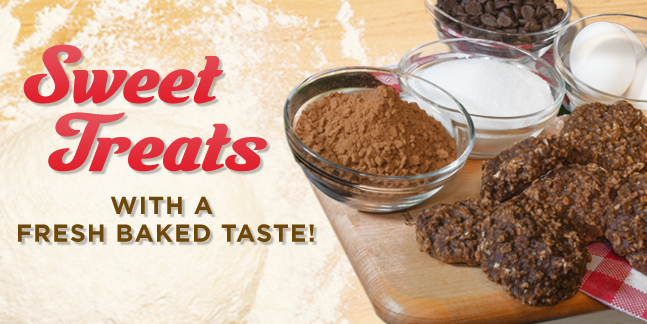 These, and our other mouth-watering selections are just what your sweet tooth craves! Something to Spoon When you just need a little sweetness, we offer a selection of puddings and fruit cups to hit the spot. Grab a spoon and dig in! Krispy Kreme There is no doughnut quite like Krispy Kreme. FiveStar brings you their melt-in-your-mouth goodness in all of your favorite flavors.